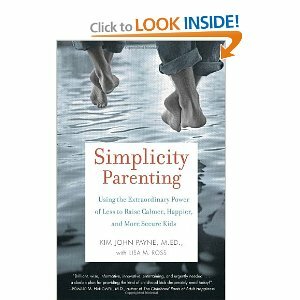 A couple months ago I read a new book called Simplicity Parenting by Kim John Payne. It’s a good and helpful book whose primary message is basically that parents should intentionally simplify life for their children and households for everyone’s good. Fewer toys, less media, intentional rhythms to guide the day, less entertaining of our kids and more time/space for them to entertain themselves. There’s nothing earth-shattering about the recommendations offered by Payne; virtually everything he suggests reminds me of life fundamentals as they existed perhaps 50 years ago. Living in such a way in today’s world, however, is considered unusual if not downright radical, and it takes intentionality and discipline. Living in such a way now suddenly has its own nomenclature: “simplicity parenting.” Crazy world. Frankly, *I* get overstimulated when we keep a busy, hectic schedule, so I know the same is true for my kids!! I haven’t read the book, but after keeping us hopping with playdates, outings, and whatnot (all of which were well intentioned and a lot were educational to boot) and finding that not only were we all exhausted, but my kids began EXPECTING a full and exciting week each and every week, I scaled us waaaay back. I essentially implemented our own version of active and calm days. It can be tough to find the balance, but my kids are more content, less overstimulated and actually do a ton more creative and independent play now that they are not waiting to see what exciting big thing we are doing next. Great post! I’ll have to check out this book, thanks for letting us know about it. Sounds very thought-provoking. And it is so bizarre that someone had to write a book about something so common sense, like you said, how live just was 50 years ago. I read this book when it first came out and loved it! It is very practical has how to examples and clear reasons why. Honestly, some of the things I had already done but implemented parts I hadn’t thought of like I didn’t consider kids books to be clutter but found less was much better! Support for doing less consciously and purposely, exactly what I needed. Parents need more of this there are so many other pressures to do more, be more, have more, more, more, more. Back to basics for a calmer more thoughtful life is good everyone.